We take the best of both the large scale and small scale manufacturing worlds and leverage them to bring you a high level of concept generation at the availability of mass market retail. 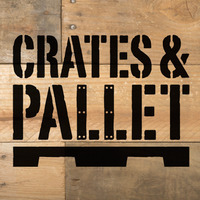 We have a workshop on-site to develop project ideas for the every-person and produce one-off products for those die-hard crates and pallet fans. Our manufacturing sources are purely American and we think where we make things is just as important as the things we make. American manufacturing means a closer control over quality, a faster development time, and best of all more American jobs. I have a bunch of pallets. Can this project be done w/o having 2 buy anything?